Since the Dark Ages, Flat Holm has been a retreat for monks and acted as a sanctuary for Vikings, Anglo-Saxons, silver miners, smugglers and cholera victims. Fortified in Victorian times and again in World War II, it’s perhaps most famous for receiving the first ever radio message across water by Marconi in 1897. A day visit provides you with three to six hours on the island, where visitors can purchase a self-guided tour pack, providing a unique opportunity to discover Flat Holm's wildlife and historic buildings. Guided tours will be available on certain dates. There will be a chance to relax and enjoy the island's atmosphere with a cup of tea or coffee, and an opportunity to visit our well stocked souvenir shop, where you can buy monoculars, postcards, Fairtrade snacks and drinks, and a range of souvenirs as a memento of your island experience. Visitors can also enjoy a selection of local beers, ales and wines at the Gull and Leek pub, while taking in the island’s spectacular scenery. 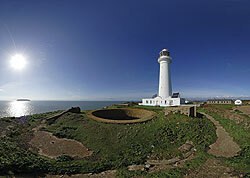 Residential visits can be arranged for individuals and groups wishing to stay on Flat Holm. Both dormitory and camping facilities are available. Please contact the booking office for more details. MW Marine operates day visits departing from the barrage in Penarth and Weston-Super-Mare, but private trips can also be arranged. Visit www.mwmarine.org or call 01934 636734 / 07754 833158 for more details. Day visits and group bookings can also be arranged with Cardiff Sea Safaris, who depart from Mermaid Quay in Cardiff Bay. See www.cardiffseasafaris.com or call 029 2048 7663 for further information. A landing fee of £5.00 for adults or £2.50 for children (payable in cash) will be collected by the warden on arrival at Flat Holm. This fee is used to help preserve and maintain the island for future visitors to enjoy.